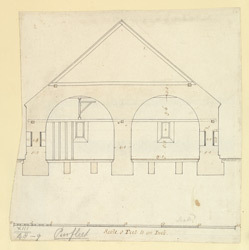 Plan of the gunpowder magazine at Purfleet in Essex. A magazine that originally stood just outside Greenwich was demolished because it had become unsafe and an Act of Parliament was passed and land was purchased at Purfleet for a new magazine. In the mid 18th century five new buildings were erected, each measuring approximately 140ft by 20ft. Each building was divided into two rooms in which the gunpowder was stored. In each room the gunpowder was stacked in large barrels which would have been lined up either side of a central aisle. Each barrel was labelled with information about the powder such as its quality and producer. When full each magazine could hold around ten thousand barrels of gunpowder. The potential for an explosion meant that the magazines were built with very thick walls and were positioned in hollows in the ground so that any explosion would be forced upwards.